@Courtney Hollyoake - yes you're right. But I have to admit, I think a pure CEV with a Demolisher Gun isn't really what I want any longer. Instead I decided to use a gun/launcher approach, so it can fire standard rounds as well as a missile (like the US Sheridan or some of the Russian tanks). Collecting your feedback and that from the other forums I think Track Skirts would be nice, but shouldn't be the standard - cover-all - type. Looking at some of the tanks in Syria and the urban fighting there, there are plenty of track skirts, but mostly all damaged and badly torn. Between the cover the top type (red) or the bed spring type (white). I'll give it a few days to think about it - and maybe get some additional feedback. As you've probably noticed the thread is no longer called "EPIALES", but rather "Rumble in the Rubble". The reason is that's it's not only about the EPIALES, but a combat scene. And as mentioned again in an urban setting - accompanying the "Ghosts in the Rubble" scene. "This diorama is depicting an Imperial Guard attack in the rubble strewn streets of an Ork captured city." While I try not to give too many spoilers on the final scene, I can reveal what the opponent for the EPIALES will be. An ORK walker - Mega Dread style. So I'll start off with the pilot. I still had this cool guy from my failed attempt at the DIRTMUNCHA (earth-)Submarine. But I re-arranged his posture a bit. Then I started to build a cockpit around him. So now it looks as if he's kind of glancing around. The cockpit is positioned within a head-style housing. Then I started to create a body for it. Rather simple Ork style. But I think it looks sufficiently menacing. With the basic body done, I went to work on the legs. Here you can already get a glimpse of the pose I'm aiming at. Plenty of pistons and hydraulics to make it steady. Then I positioned the other leg. And started the first foot. But I realized it makes no sense to start with the foot, if I don't know how thick the leg will be with all the armor, pipes and other stuff on it. It hurts a bit to cover up all these nice pieces and hydraulics. as mentioned in the previous post I have to gain a bit of distance from the "Raiders of the Lost Light" diorama, to be able to judge it more objectively and see what still needs to be done. But being idle is dangerous to me. My wife was on a trip over the weekend, so I had plenty of time. I knew I wanted to do another vehicle - most likely based on the POLEMOS ("Ghosts in the Rubble") - and I have an scenic idea in the back of my head... but it isn't clear enough to phrase it out. While thinking of the project, I remembered this base I created a few years ago for an Inquisitor scene that never made it. But the POLEMOS isn't very big either. As said, the POLEMOS will be the base. So I dug out the old plans and measurements and started drawing and cutting. In comparison to a WH40K trooper. One thing I decided early was that I didn't want to delve into casting again. Luckily a follower of my blog (who wants to remain anonymous) did send me a few things, including an old Trumpeter T-55 kit. I always loved the T-55, it's such an iconic tank and a real warhorse. 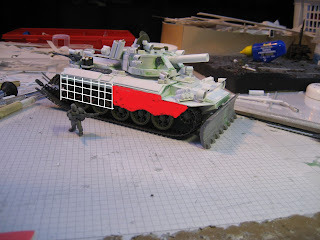 So, instead of re-casting the POLEMOS wheels and tracks, I decided to use the T-55 wheels and tracks. The hull was originally designed for 4 (larger) POLEMOS wheels, but has just enough room for the 5 T-55 wheels. With that decided; I finished up the body work. But I still wasn't 100% sure what kind of vehicle it would be. After some brainstorming with my scene idea, I fancied a "Combat Engineer Vehicle". So definitely a tank sized turret. Did I mention I hate turrets? I mean I really love them, but designing them myself is a bummer. But, without hesitation I started to build the turret base. It looks like a KV-2 turret. The base is pretty much the same - a bit wider maybe. The gun got a bit longer and the turret lower. And the vehicle on the base looks pretty neat too. Next was the rear section, with the exit ramp. Then it was the first fiddly part - building the vision ports. But they are totally worth the effort - I think. Another mini piece were the hinges. and mounted them to the ends of the rods. Then another small disk to close it up. He looks good between his brothers. On the left the POLEMOS and on the right the PONOS. Now that he's part of the family, he needs a name. Even though I strayed from the Combat Engineer Vehicle I still need a dozer blade for the scene. So I cut and merged two WH40K dozer blades, and together with the tracks, this looks rather nice, doesn't it? So, this is as far as I got in 4 days (working almost full time). Still needs rivets, but I'm not sure if I want to add track skirts. But I simply LOVE the T-55 wheels and tracks. Does the vehicle look OK? Oh, yeah, as usual my Guards will battle it out with Orks...more or less the same battle as "Ghosts in the Rubble".